The seal must have belonged to a senior Egyptian official, who “filled a similar position to that held by Joseph in Egypt”, archaeologist says. An Israeli birdwatcher accidentally discovered an ancient scarab seal in northern Israel’s region of Tel Dor, near the city of Haifa, researchers at Haifa University announced on Sunday according to Jerusalem Post. Birdwatcher Alexander Ternopolsky found the engraved stone seal at the coastal excavation site located south of Haifa before handing it over to archaeological authorities. “The rains this past winter must have eroded the soil on the southern slope of the site, and thanks to Mr. Ternopolsky’s keen eyesight, the scarab was discovered and handed over to us”, explained University of Haifa professor Ayelet Gilboa, who co-heads the excavations at Tel Dor. 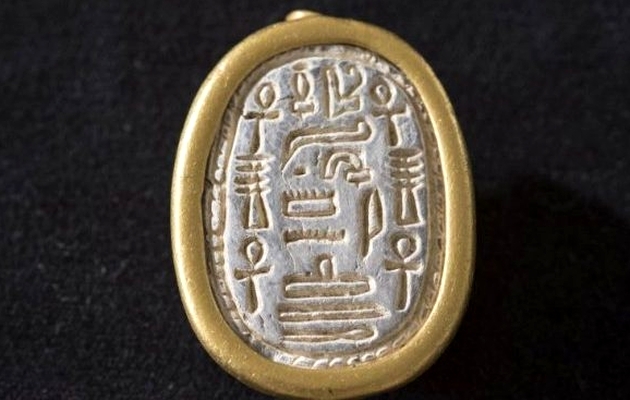 According to the archaeologists, the rare scarab seal belonged to a senior official of the Thirteenth Pharaonic Dynasty, which reigned in Egypt during the 18th-17th centuries B.C. Experts have suggested two possible scenarios in which the scarab reached the site. The first one proposes that a representative of the ruling Egyptian viceroy arrived to the trading city with the seal in hand in order to complete a deal for his superior. The other hypothesis argues that the scarab arrived as part of an antiquities trade at a later point in history. But, “since the scarab rolled down from the mound and was not found in its archaeological context, we will probably never really know when and how it got here and where it has been”, Gilboa asserted. According to initial studies of the scarab, stone engravings reveal the name of the seal’s owner, his position along with symbolic hieroglyphics. 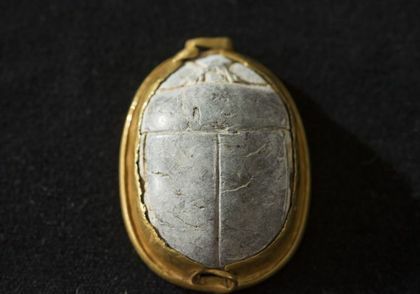 “Scarabs were very common objects in ancient Egypt, but the size and quality of this one, its owner’s high-ranking position, and the gold ring in which it is set all make this particular scarab a rare finding in our region”, the co-director of the excavation explained. The coastal city of Dor at the foot of Mount Carmel was a key port city for thousands of years. Until the Romans built Caesarea, Dor was the most important commercial centre in area and a trading base for spices, resin, and other commodities that were highly valued by the ancient Egyptians. The city was even mentioned in several ancient Egyptian documents dating back 3,500 years, as well as in the Bible, in Joshua, Judges and I Kings. Excavations will continue next July, and are opened to volunteers willing to work in Israel.